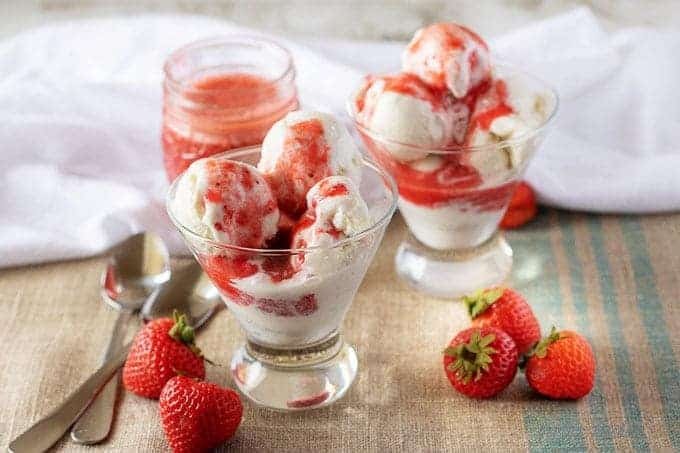 A simple four ingredient strawberry sauce that’s the perfect topping for angel food cakes, crepes, ice creams, or any other sweet treat! Kim will tell you, out of all the people she knows, I have the worst sweet tooth. It’s always been that way, even as a child. My parents once told me about a time with they had garden in New Mexico. I was just a toddler then, but apparently I got away from them and raided the fresh strawberries. When they found me, I was sitting in the dirt, right in the middle of the berries stuffing my face. So, it should come as no surprise that berry sauces are my favorite dessert topping. For today’s dish, I decided to share my four ingredient strawberry sauce. You can use it to top ice cream like we did or try it on pancakes, pound cake, buttermilk biscuits, or even a breakfast pastry for the ultimate guilty pleasure. First, gather up the fresh strawberries, sugar, and salt. Measure out a 1/4 a cup of water and set it aside. At this point, you’ll want to wash the berries and remove their stems and the pale portion underneath the stems using a small kitchen knife. This is also known as hulling a strawberry. Next, grab a stock pot or a large saucepan and dump all the ingredients in together. Put the pan over medium heat and grab a wooden spoon. Go ahead stir the mixture from time to time, while it cooks for the next 20-25 minutes. 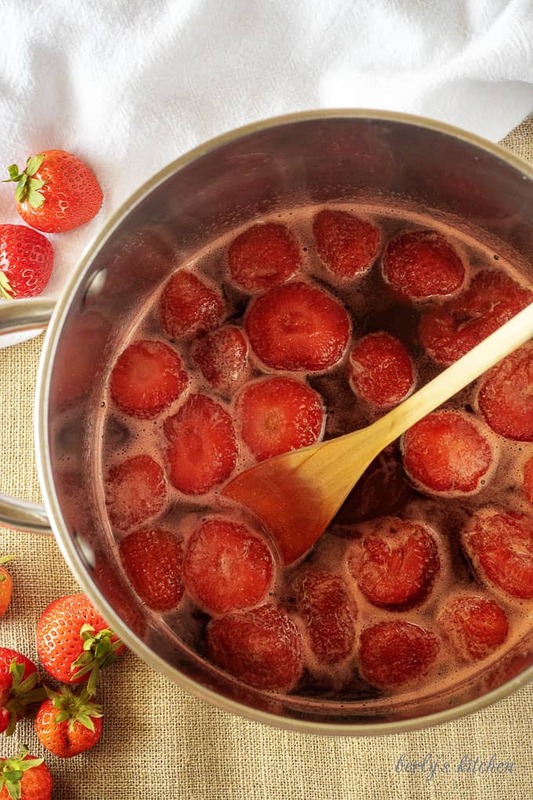 After the strawberries have cooked down a bit, remove the pot from the heat. Now comes the only part that’s kind of a pain. You need to stir the mixture for about 15 minutes so it can cool. It’s needs to cool a little or you risk burning yourself on the next step. Then, use an emulsifier to blend the strawberries and liquid together. If you don’t have one, it’s okay, use your blender or food processor. However, you might want let it cool a little longer just for safety’s sake. Last, use the strawberry sauce while it’s warm or store it away for later. We like to make this sauce the night before a special breakfast. It goes great on crepes, angel food cake, or just about anything that uses a syrup. 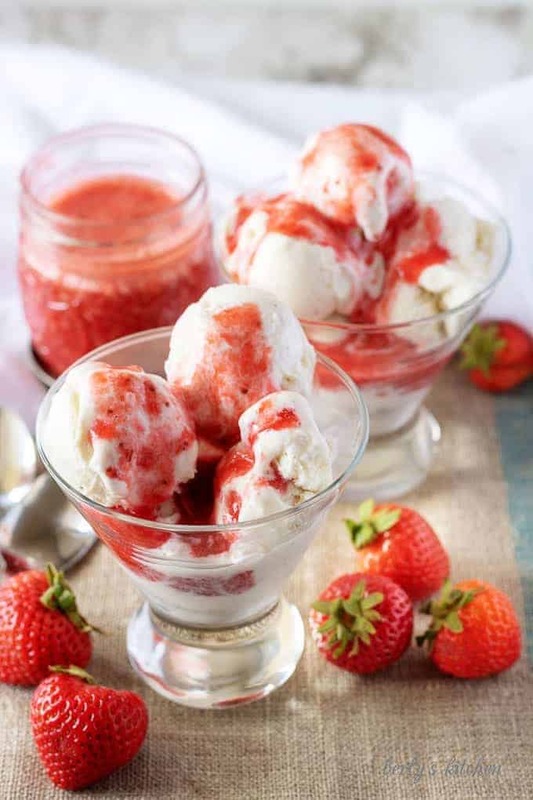 Strawberry sauce can be stored in your fridge in a sealed container for up to 3-days. Mason jars work the best for us, but Tupperware will suffice as well. Don’t like strawberries, that’s fine. This recipe works with all sorts of berries, experiment and find your favorite berry sauce. Fresh fruit not in season, then use frozen varieties. Just make sure to thaw them out and pat them dry with paper towels. Make sure to properly stir the mixture as it cooks; otherwise, the sugar will stick to the bottom of your pan and caramelize! Want a delicious dish to cover with an easy strawberry sauce? Then take a look at our Dutch Baby Pancakes or our Banana Oat Pancakes! 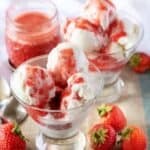 If you like this easy strawberry sauce recipe, please leave us a comment and rate the recipe card. You can also find us on Facebook, Pinterest, Twitter and Instagram searching for Berly’s Kitchen! 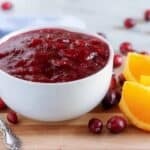 A simple four ingredient strawberry sauce that's the perfect topping for angel food cakes, crepes, ice creams, or any other sweet treat! First, wash the berries and remove the stems. Next, in a large stock pot, combine all the ingredients and cook over medium heat for 20-25 minutes. Then, remove the pot from the heat and stir the mixture for 15 minutes to cool. 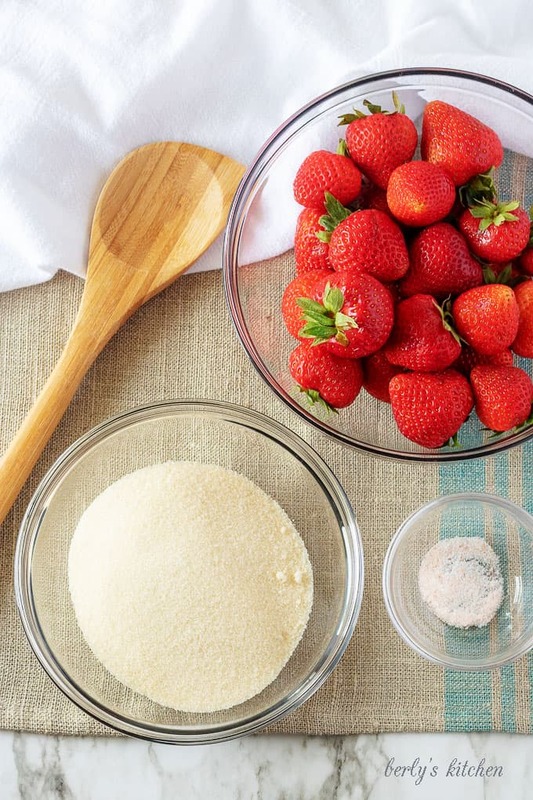 Now, use an emulsifier or blender/food processor to blend the strawberries into the sauce. Last, use it right away or store it in your fridge in a sealed container for up to 3 days. The calories listed are approximation based on the ingredients and a serving of one ounce and only includes the sauce, not the ice cream. Actual calories will vary. 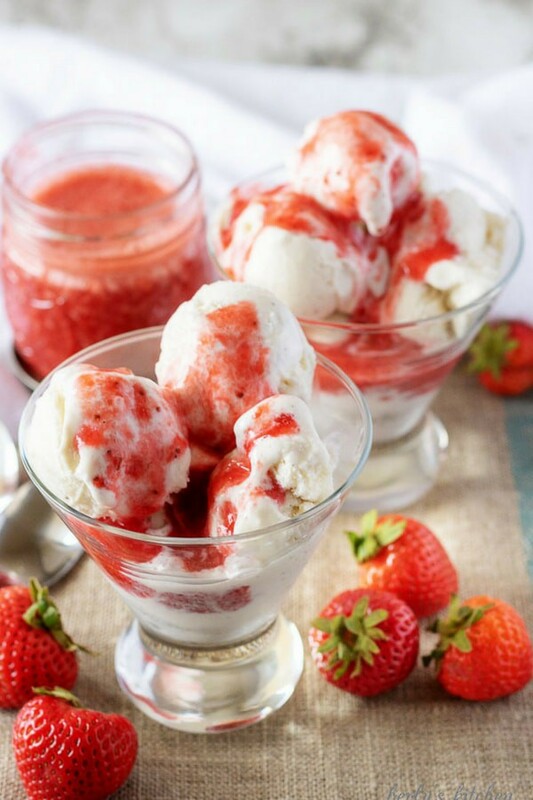 The strawberry sauce can be stored in your fridge in a sealed container for up to three days.